A team of researchers with the Woods Hole Oceanographic Institution has found that coral larvae prefer to set up a new home in a place noisy with other living organisms over a barren soundless site. In their paper published in the journal Royal Society Open Science, the group describes experiments they carried out around reefs in the Caribbean Sea and what they learned from them. As humans continue to pump carbon dioxide into the atmosphere, it not only heats up the planet, but causes the oceans to become more acidic. And as the oceans become more acidic, coral reefs have begun dying. For that reason, ocean scientists have been studying them to learn more about their nature, hoping to find a way to save them. One such focus is trying to better understand the factors at play as coral larvae carried by moving water choose a spot to stop and set up new growth sites. Prior research has shown that such larvae are sensitive to temperature, light and chemicals produced by other creatures living in the sea. 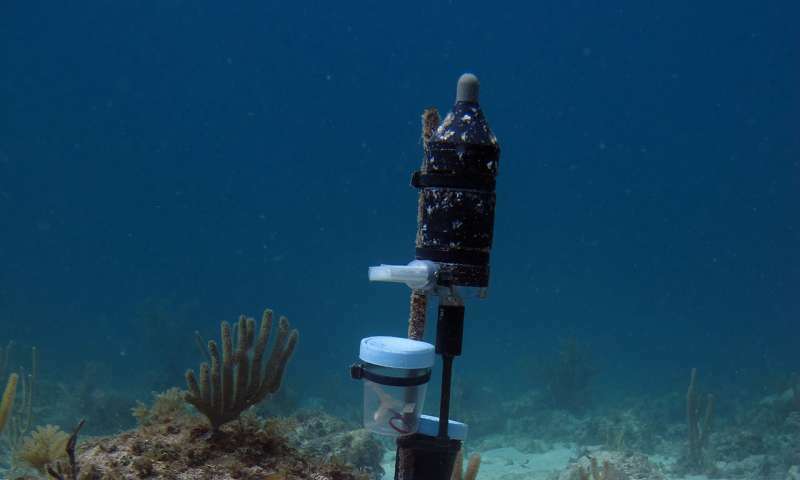 To find out if sound might also play a role, the researchers placed 18 boxes (half of which had transparent walls) filled with water and coral larvae at three sites ranging from a healthy reef environment to a barren lifeless site. Each site was deemed to be equal in terms of natural light. The biggest difference between them, the team notes, was the amount of noise generated by the creatures already living there. In a bustling reef, there are a wide variety of low-frequency sounds. Barren sites, on the other hand, are usually devoid of all sound except for the high-frequency noise shrimp make. The team left the boxes in place for two and a half days and then checked on them to see if the larvae had found the site suitable for setting up house. They report that 50 percent more larvae had settled into their new homes in the boxes placed in heavily populated, noisy areas. The findings indicate that coral larvae also use sound as part of their decision-making when deciding where to settle. This finding also suggests that the coral larvae could be induced to repopulate barren areas by setting up speakers in the vicinity to blast out noisy reef sounds.